Featured in the Nov. 2017 issue of Our State Magazine. Follow link to full photo essay. Thank you to Our State Magazine and everyone involved. Our eight state-recognized tribes each have their own stories and traditions, but they share an important bond, too: a love of this land that traces back to the first people who called it home. Joshua Adams grew up around wood carving: His uncles carved, his great-uncle carved, and the tools of the trade were always nearby. Adams developed his own style in carving classes at Cherokee High School, imbuing every piece of his art with cultural purpose. 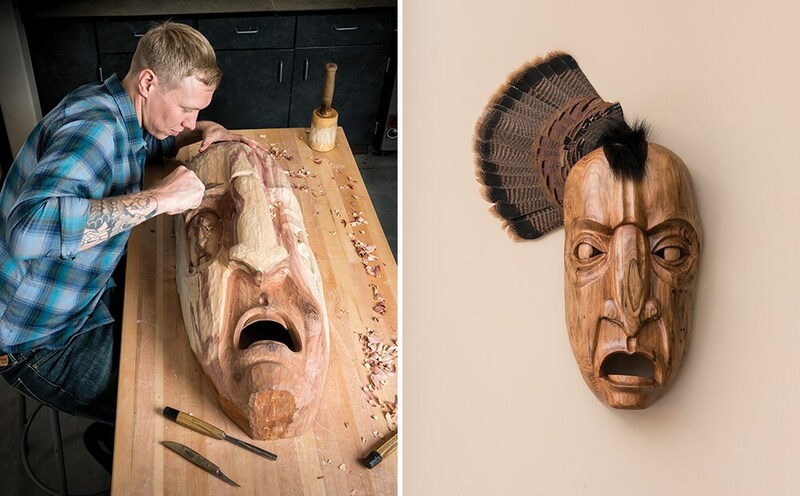 Hand-carved masks, with their proven place in Cherokee history, are a natural medium, and he draws on the tribe’s stories and legends to create pieces like the award-winning False Faced God (left) and Clan Gatherer (right). Now, Adams teaches the carving class he once took at Cherokee High, often reminding his students that as artists, there’s no better source of inspiration than their own vibrant heritage. Posted on November 13, 2017 by Joshua Adams.